America has been blowing in some great numbers for electricity generation from wind. There was $25 billion invested in the wind industry in 2012. All 50 states have either a wind farm or a wind industry factory. In the electricity generating industry from building the facility to generating the electricity, wind is cheaper than coal and nuclear, and comparable with natural gas. In fact 42% of new electric generating in America has come from the renewable energy giant, wind. When you factor in the other benefits of renewable energy generation like wind, it should be a clear leader in the energy field. The planet’s health and human health benefits are huge. Clean wind power in place at the end of 2012 has avoided about 100 million metric tons of the climate changing gas carbon dioxide from going into the atmosphere. These gases have lead to climate changing extreme weather that has cost America $188 billion in 2011 and 2012. Remember the record weather we have had in Central Illinois in the last two years, ranging from record temperatures, drought, river heights, rainfall, and mudslides. Also since wind power neither uses or pollutes water, as opposed to fracking, coal, and nuclear industries, it saves 38 billion gallons of water per year. The use of all this water has depleted ponds, lakes, streams, and underground water tables. This water is needed for drinking and crop irrigation. In Central Illinois we now have numerous wind farms, a few are: Ridge South Wind Farm in Livingston Co., Horizon Wind Energy by Pontiac in Livingston Co., White Oak Wind Farm by Carlock, Rail Splitter Wind Farm partially in Tazewell Co., and Twin Groves Wind Farm by Bloomington, Normal. These farms not only provide clean electric energy at a good cost they also contribute to communities in other ways. For example in the contract agreements county boards include language that ensures that roads are repaired if the heavy equipment degrades them. Taking a look at the Twin Groves Farm we see that they have 240 turbines that produce 1.65 megawatts of electricity each. This electricity can supply the needs of about 120,000 homes for a year. Twin Groves covers 22,000 acres of farmland outside of Bloomington/Normal. But the actual agricultural land being lost to the towers is only 1 % of the total acreage, or 220 acres. This is because farmers can still plant and harvest all but a small area around the bottom of the tower. A huge bonus for the farmer is that for every tower located on his land Twin Groves pays him $5000 a year in leasing fees. The Twin Groves Farm also helps support 2 schools to the tune of $250,000 in tax revenue to each district per year. Another financial benefit for the area is the jobs and payrolls that it pays contributing many millions of dollars a year to the local economy. The wind industry supports about 80,000 jobs across the United States, about 25,000 in manufacturing of parts. When the industry first got going in America the majority of parts were made in other countries. Now it is estimated that almost ¾ of the parts are Made in America. Making sure that this clean useful industry continues to grow we need our politicians to support it. In Illinois the legislature passed a Renewable Portfolio Standard that said Illinois would produce 25 % of their electricity through renewable by 2025. 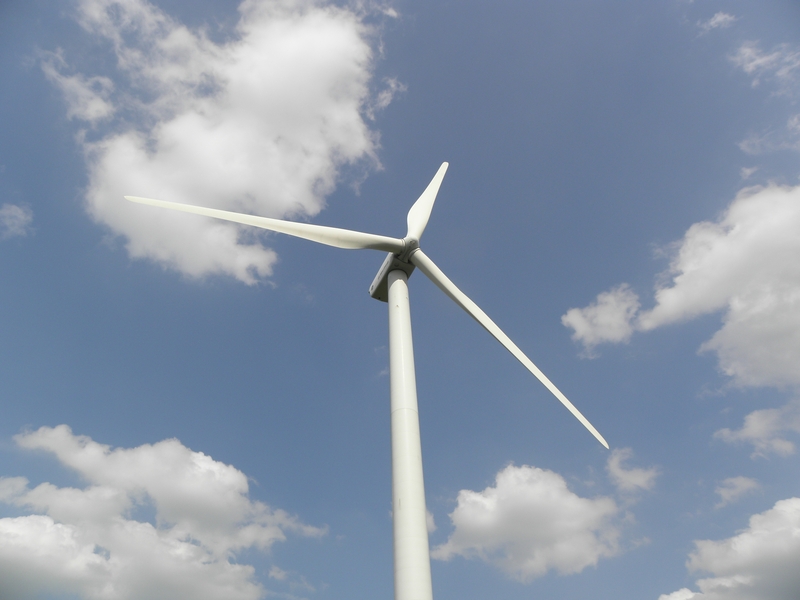 Another driving force is the Wind Production Tax Credit (PTC). This gives tax incentives to companies in the wind generating industry. We have been giving tax credits to fossil fuel generating industries for a very long time. The oil industry has been getting tax subsidies for 100 years. This PTC is a much smaller amount than is currently provided to the fossil fuel industry. Finally, you might remember that many towns in Central Illinois aggregated their electricity two years ago and it reduced people’s bills by about 30 %. When this great bargain was struck by many municipalities it was stated by almost all of them that they wanted 100% of their electricity to come from clean renewable energy sources, like wind. I hope you can see that Wind Power is right for Central Illinois. Now we have to keep reminding our elected officials that they need to support the wind industry through the legislation they pass. Tours of the Twin Groves Wind Farm for groups of 10 or more people can be setup by calling 1-309-724-8278.